Ha! I call bullsh*t on those mothers! Seriously – I get to the school gate after a stressful hour of ‘Where’s your other shoe?’ and ‘Well why didn’t you TELL me you needed £7.50 to take to school today?’, looking like I’ve been dragged through a hedge and with remnants of yesterday’s mascara under my eye … and I spot THAT mother. She’s got five kids, she’s on her way to her successful career and I casually consider whether she takes valium or just has a lot of therapy and a considerable amount of wine every night! Yesterday’s mascara is the only thing that makes me look human on a morning! Although I have to say I’m happy for women who have it all together, those who are super organised, and do cope well. But my bug bear is the mothers who pretend to be doing it all by themselves. No one person can get 3 or 4 kids ready, tidy up the breakfast stuff (along with the dribbles on the toilet seat!) remember EVERYTHING and do a full days work. I’m convinced it doesn’t happen! And anyway what’s wrong with admitting we all have or at least need a little help? Thanks Jenny! I’ll definitely be back! 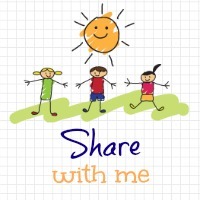 Loving reading the variety of posts on #sharewithme. I just have to work out how to share the badge now so others can use your blog hop! It’s great! Thanks again! If you want to the badge its a matter of copying and pasting the code in the box I provide but if you want to share the actual blog hop so people can enter off your site too hun you click the “get the code here” under where you entered your link and it will give you a code to input at the bottom of your post make sure you are in html view mode and paste the code provided and then update your post and you will have the badge and the blog hop. Anymore help just email me and I can help you darling. Blog hops are great to get to know other blogs and bloggers.